‘Obesity prevalence among healthcare professionals in England: a cross-sectional study using the Health Survey for England’ – published on 5 December 2017 in BMJ Open – warns of the risks to the National Health Service as a quarter of nurses in England were found to be obese. This is the first national study to provide reliable estimates of the prevalence of obesity among healthcare professionals in England. The study was led by Dr Richard Kyle at Edinburgh Napier University’s School of Health and Social Care and Professor Jane Wills at London South Bank University’s (LSBU) School of Health and Social Care. The study analyses a cross-sectional cohort of 20,103 individuals aged 17-65 years who completed the nationally representative Health Survey for England over a five year period (2008-2012). Of this sample, 422 adults were nurses, 412 were ‘other healthcare professionals’, 736 were ‘unregistered care workers’ and 18,533 were employed in non-health related occupations. The sample included only those who were working at the time of the study to enable comparisons to be made between different groups of healthcare professionals and the general working population. Obesity prevalence was high across all groups of healthcare workers, with 25.1 per cent of nurses found to be obese, while 14.4 per cent of ‘other healthcare professionals’ were also found to be obese - a group that included doctors and dentists. Unregistered care workers had the highest prevalence of obesity at 31.9 per cent. This compared with obesity prevalence among the general working population of 23.5 per cent. Dr Kyle, Director of Edinburgh Napier University’s ‘Nurses Lives Research Programme’ and co-author of this study said: “Obesity is a global pandemic and healthcare professionals are at the heart of efforts to bring down high levels of obesity among the population. That one in four nurses in England have been found to be obese is deeply worrying, not least because we know that obesity is linked to diseases such as cancer, cardio-vascular disease and diabetes. Prof. Wills, co-author of the study, said: “The high prevalence of obesity among the healthcare workforce should urge policymakers and employers to provide solutions through workplace initiatives that support staff to maintain a healthy body weight. The study also pointed to potential problems for the future nursing workforce. Obesity prevalence was found to be especially high among older nurses. 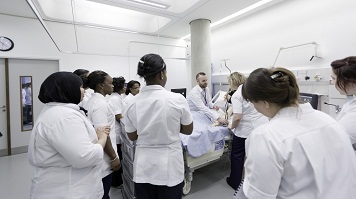 As almost half (47.1 per cent) of English nurses are over the age of 45, this poses a likely future burden of ill health for the healthcare workforce. Obesity is a major risk factor for musculoskeletal conditions and may be a risk factor for common mental health conditions such as depression and anxiety which are the main causes of sickness absence in the health service. Download ‘Obesity prevalence among healthcare professionals in England’. 1.London South Bank University is one of London's largest and oldest universities. Since 1892, we have been providing vocationally-relevant, accredited and professionally recognised education which transforms lives, businesses and communities. 2.Read more research previously conducted by LSBU in this area as part of the Healthy Weight Initiative for Nurses (WIN).